Apply a lot of nice and fun photo effects to joke with your friends. AnyMaking free online photo editing software makes beautiful artworks from your everyday's pictures! Select any funny photo editing tool, upload your picture and that's it! 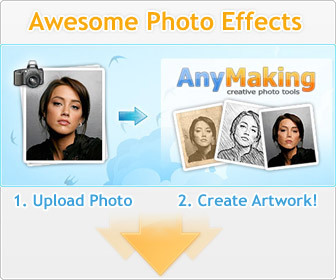 AnyMaking free photo edit tools helps you to easily edit any image in a few seconds. Start your online photo editing with selecting any tool below. AnyMaking free picture editing is absolutely free!